Buildings are an important aspect of model railroading that add to the realism of a layout. You can gradually add buildings to your layout over time, the most important thing to do when adding buildings is to incorporate them properly into your scenery. There a 3 types of building you can use in a model railroad layout. The quickest and easiest way to add buildings to a layout is to use ready-made buildings. There are a number of manufacturers who produce ready-made buildings in all the popular scales, these buildings are usually made out of plastic. If you have a limited budget cheap ready-made buildings can be purchased and enhanced with custom paint and weathering. Kits that you assemble yourself come in a variety of different forms including plastic, laser cut wood and cardboard. These kits require some skill to assemble but look more realistic than ready-made buildings. Some modellers choose to create their own buildings from scratch. Custom buildings can be built from plans or modelled using a real world buildings as a guide. If you enjoy the modelling aspect of model railroads more than running trains creating custom buildings will provide you with hours of enjoyment. If you are just starting out you can build simple structures such as phone booths, outhouses and sheds. There are several types of buildings that are only found near railway lines. If the emphasis of your layout is creating an accurate railroad you should include these types of buildings. Generally consist of a platform and a station building for ticket sales and waiting passengers. Passenger stations may also provide connections to other transport services such as buses and trams. Stations located at the end of a line are known as a “terminus” or “terminal”. Used for loading and unloading goods onto a train. Freight stations can be situated by themselves or along side a passenger station. Freight stations are often equipped with a crane for transferring containers. Due to the decrease in freight transportation by rail many freight stations have been abandoned or demolished. Coaling towers or coaling stations as they are also known were used to facilitate the re-fueling of steam powered locomotives. Coaling towers used a gravity fed system that allowed coal to slide down a chute into a waiting locomotives coal storage area. Although not commonly used on modern train lines signal boxes ensured that trains operated safely, over the correct route and to the timetable. A human operator would occupy the signal box and control line side switches and signals. A place to store locomotives when not being used or repaired and maintained. Engine sheds often feature a roundhouse where the tracks radiate from a turntable. The main tasks performed inside an engine shed include ash removal, boiler washout, coaling and watering. Having trains that constantly derail is a frustrating experience that most model railroaders will encounter, especially if you are operating a smaller scale or older trains. The good news is derailments can be fixed by addressing several common causes of the problem. Derailments are caused by either a problem with the track or a problem with your train. You can eliminate track problems by running a second train along your track. If the secondary train doesn’t derail you more than likely have a problem with your train, if it does derail you’ll need to inspect your track for potential problems. Loose rail joints – it’s not uncommon for rail joints to become loose over time. You can check for loose rail joints by running your fingers over the track looking for any points where the track doesn’t line up evenly. If the track is joined correctly but the rails still don’t line up you may need to use a file to level them out. If a section of your track comes loose on a regular basis you can solder the joint to prevent this happening in the future. Faulty switches – one of the most common cause for derailments is a faulty switch. First you need to ensure that wheels are not coming off the track before hitting the switch as this is not a problem with the switch but rather with the preceding track. Switches need to be sharp to correctly guide the train wheels over them, blunt switches can be sharpened using a file. Also check the switch is moving to the correct position and not getting stuck. Dirty tracks – small pieces of ballast or debris that have come loose can easily derail a train. 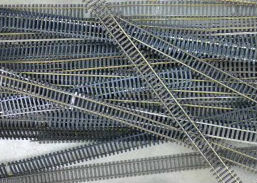 To remove debris from your track use a small soft bristle brush and run it along the inside of both rails making sure there is nothing caught underneath them. Faulty couplers – couplers that snag or don’t line up at the same level will cause problems. If you are running carriages that are new they may need to be worked in to ensure they move freely and are center aligned. Couplings also need to sit at the same height as one another, if required adjust the height so both couplings meet at the same level. Faulty wheelbase – wheels on both locomotives and carriages need to be in alignment. If wheels are not aligned correctly they bind against the track and can jump the rails. All wheels should also spin freely, if any wheels are not spinning freely apply a small amount of lubricant. If lubricant doesn’t loosen the wheels you’ll need to have them replaced or repaired. Freight car weight – model freight cars are often not heavy enough to stay engaged on the track at all times. If this is the case small weights can be added to the inside and fixed into place using double sided tape. The weight should be placed in the center so that it’s distributed evenly over both sets of wheels and doesn’t affect the center of gravity. Most trains will run on any brand of track so long as the scale and gauge are correct. When buying and laying track it is important that each piece of track has the same code. Code refers to the height of the rails and is represented as either 100,83,55 or 40 with 100 being the highest. 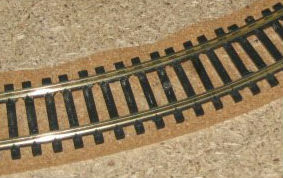 Model railroad tracks are sold in sections of either straight, curved or flexi track. Curved track is pieced together from multiple pieces to form 1 or 2 standard corner radii, flexi track comes in longer lengths that can be bent into freeform shapes. Some tracks like the Bachmann E-Z track come with a plastic roadbed already fixed to the base of the track. I prefer not to use this type of track as they are aimed more at the beginner and not of the same quality as plain track. Begin laying out your track one section at a time according to your plans. Once you have laid down your whole track make sure you are happy with the layout making any changes if necessary. If you are not using track with roadbed already attached you should mark out your layout onto the baseboard using a felt tip marker so you know where to lay your roadbed. Roadbed is made out of either cork or foam and sold in short lengths. Roadbed can be glued to the baseboard with a PVA glue using the marks you made as a guide. Once your roadbed is in place you can begin laying your track proper. Take your time and ensure that all track joints are secure, run your finger along the track to ensure joints are smooth. At this point in time you can solder together the joints to ensure they don’t shift, this is however optional. Track can now be glued into place using a clear drying glue. If any glue gets onto the tracks be sure to wipe it off as it can effect the transfer of electricity through the tracks. Small pins can also be used to hold the track in place. Track ballast is the stone bed that railway sleepers/ties are laid upon. Ballast really adds to the realism of a layout and is quite easy to do. When purchasing ballast be sure to get the correct scale, I would also recommend using both a coarse and fine grade ballast. You will also need some isopropyl alcohol, hobby glue and a small paintbrush. 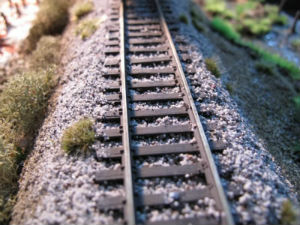 Start by adding the coarse ballast to the sides of your track and the fine ballast along the center of the track. Using a small brush clear away any ballast from sleepers/ties. Next make a wetting agent using a 70/30 mixture of isopropyl alcohol and water and apply to the ballast, a small spray bottle is perfect for this task. The ballast can now be glued using a 50/50 mixture of glue and water. Soak the ballast ensuring the glue gets into all the crevices then allow to fully dry. Once ballast has been completed go over the tracks to make sure there is no ballast obscuring the tracks that could cause derailments. If any ballast has become glued to the tracks use a small hobby knife to remove. Digital command control (DCC) is a system that allows you to control different locomotives on the same section of track. A DCC command system sends encoded digital messages to the track as well as providing electrical power. Digital messages are then decoded by a unit installed inside each locomotive. Light, smoke generators and sounds can also be controlled independently using DCC. 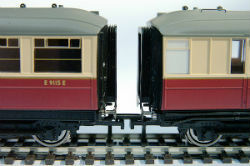 To install DCC on your layout you will need two things, a DCC system and a decoder. A quality entry level system will cost around $200. All these systems require to get up and running is the connection of the DCC system to your track, you shouldn’t run into any problems connecting to an existing DC layout. When shopping for a DCC it is best to get a system that is NMRA compatible*, this will allow any locomotive with a NMRA decoder to run on your system. *The DCC protocol is defined by the Digital Command Control Working group of the National Model Railroad Association (NMRA). The NMRA has trademarked the term DCC. digitrax.com – Complete train control systems including DCC. cvpusa.com – NMRA standard DCC systems including EASYDCC. Start from $20 and increase in price depending on the type of connection and locomotive they are being fitted inside. Some decoders are able to be plugged straight into the locomotive other will require the connecting wires to be soldered. Newer locomotives will more than likely have pins so the decoder can be plugged in directly, older style locomotives will more than likely need to be wired by hand. Wiring a decoder yourself will require some electrical knowledge. Remove body from locomotive and check for available space to fit decoder, inside of body may have to be modified if not enough space is available for the decoder. Connect decoder as per instructions, trim any wires that could become caught in moving parts. Decoders will work satisfactorily on their default settings however you may want to change the address of the decoder so you have independent control of individual locomotives or adjust the starting voltage so that trains take off smoother. DCC also allows you to control sound effects and other accessories such as lighting and control points. To install sound effects you will need a sound decoder and speaker unit, these can be expensive but add to the realism of a layout. Decoders to control lights and accessories are produced by many manufacturers and are relatively simple to install. If you want to take DCC to the next level it can be connected to a computer. This allows you to control your train via a graphical user interface and also program your trains to run automatically. jmri.sourceforge.net (free) – building tools for model railroad computer control. perecli.com/rrauto (free) – powerful user friendly command and control solution. bigbearrail.com (commercial) – Big Bear DCC railroad controller software.